BENTHAM – quite a character! The phrase was coined by one of my great philosophical heroes, Jeremy Bentham. Living from the mid 18th century and well into the 19th century, Bentham defined as the “fundamental axiom” of his philosophy the principle that “it is the greatest happiness of the greatest number that is the measure of right and wrong”. He became a political radical whose ideas influenced the development of welfarism. He advocated individual and economic freedom, the separation of church and state, freedom of expression, equal rights for women, the right to divorce, and the decriminalising of homosexual acts. He called for the abolition of slavery, the abolition of the death penalty, and the abolition of physical punishment, including that of children. He has also become known in recent years as an early advocate of animal rights. Though strongly in favour of the extension of individual legal rights, he opposed the idea of natural law and natural rights, calling them “nonsense upon stilts“. “This is such an important book and a great read. It is not an overstatement to say that our future survival may depend on the public’s ability to distinguish between science and pseudo-science. 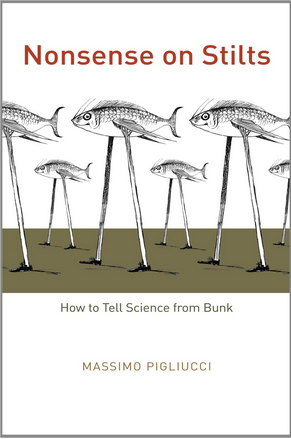 With patience, precision, and humour, Massimo Pigliucci charts a careful course for all scientists and communicators to follow”. Someone that I have come to know quite well and hugely respect through the anti-fracking movement turns out to be an anti-vaxxer. That huge respect is therefore being severely challenged and I am hugely saddened by this. I am struggling to come to terms with the reality that hugely intelligent, passionate campaigners, inspirational and influential personalities can be so right on some things and yet so wrong on others. Before anyone starts accusing me of having the arrogance to assert that I am never wrong, or the like, this would be to miss the point entirely. I have not done the research to establish the scientific truth of anything. I know nothing other than what my own senses and intellect have told me and I have come to realise, with ever greater frequency, just how fallible both those things are. What I do have is a half-decent grounding in science and philosophy. With the tools these have provided me, it allows me to discern sense from nonsense; the credible from the incredible; the reasonable from the unreasonable. This is not always an easy thing to do, and there are many issues where I remain unconvinced one way or the other, either because the science itself remains inconclusive, or more likely because I simply cannot get my head around what the science is telling me. However, in the tradition of philosophers like David Hume, Thomas Paine and Jeremy Bentham, I do believe we have a moral duty to do our best to distinguish sense from nonsense. As Pigliucci points out, however, this can be a difficult task that is patently beyond many people. It requires an understanding of the nature and limits of science, of logical fallacies, of the psychology of belief, and even (perhaps especially) an understanding of how politics and sociology impact on all this. I am often accused of being closed-minded and intolerant. This reflects flaws in my personality rather than the truth of my disposition. My mind is always open to sound evidence. I have changed my position on many issues in the light of newly revealed evidence. I do not change my mind just because forceful personalities encourage me to do so. As a professional teacher, I have always been tolerant with people willing to learn. I am also very tolerant of ignorance that is the result of circumstances beyond a person’s ability to control or do anything about. On this basis I can respect most people who hold all manner of religious beliefs, as I understand how indoctrination of the young works and how hard it can be to break free from its controlling influence on your mind and your daily life. It was a difficult journey for me to make myself, being brought up in the Roman Catholic church. I am, however, increasingly intolerant of the mindful ignorance in those that have the intellect and education to do better than be conned into anti-scientific crusades. The get out clause there is the word ‘conned’, as this is what they have been. Pigliucci’s book does a fine job of explaining how this comes about. A good starting point is Karl Popper’s famous “demarcation problem”. The demarcation problem in the philosophy of science is about how to distinguish between science and conscience, including between science, pseudoscience, and other products of human activity, like art and literature, and beliefs. The debate continues after over a century of dialogue among philosophers of science and scientists in various fields, and despite broad agreement on the basics of scientific method. Essentially, Popper believes that fields like psychoanalysis and sociology are unscientific because they are “unfalsifiable”, while true sciences, like physics and chemistry, are never absolutely proven because they are always open to the possibility that new evidence will falsify them. It is often categorised as either ‘hard science’ or ‘soft science’. The latter may well use the scientific method, but the nature of the subject matter and the evidence involved results in the demarcation problem. This does not mean soft science is not science, but just that they have additional problems in terms of their degree of certainty (which, remember, is never 100% for any science). Another issue is that of quasi-science – i.e. ‘almost science’, if you like. On the one hand, it happens around the fringes of the acknowledged ‘hard’ sciences like physics. When physicists start philosophising about things beyond their ability to currently apply the scientific method to, such as multiverses and the multiple interpretations of quantum mechanics, often based on little more than mathematical modelling, then we begin to see “the potential mathematical elegance being far removed, or even alien to, physical reality” (Lawrence Krauss ‘Hiding in the Mirror‘). Quasi-science is not the same as pseudoscience. Pseudoscience is a claim, belief, or practice presented as scientific, but which does not adhere to the scientific method. A field, practice, or body of knowledge can reasonably be called pseudoscientific when it is presented as consistent with the norms of scientific research, but it demonstrably fails to meet these norms. Pseudoscience is often characterised by the things listed to the left. The term pseudoscience is often considered pejorative because it suggests something is being inaccurately or even deceptively portrayed as science. It is, either innocently or corruptly, the product of faulty thinking. Accordingly, those labeled as practicing or advocating pseudoscience often dispute the characterisation. The list of pseudoscientific topics is mind-bogglingly extensive . Most are harmless. Some are almost certainly beneficial to some extent (things don’t have to be scientific to be beneficial – some people even derive benefits from religion after all). Pigliucci then goes on to discuss the role the media plays in advancing pseudoscience and assorted bunk. Newspapers, television and social media lap it all up (although, surprisingly, he overlooks social media, which I think has a hell of a lot to answer for in terms of giving bunk traction with intelligent people). He follows this up with the role of ‘think tanks’ and ‘public intellectuals’- much beloved of the media to give all sorts of bunk a veneer of supposed credibility. This is not to say all think tanks and public intellectuals are corrupt or heretics. But we all have our favourites that we take to be reliable and therefore rarely question. For me, I much love Noam Chomsky and Carl Sagan, along with the work of Compass and the New Economics Foundation, but on the other hand, Newt Gingrich, David Starkey, the Centre for Social Justice and Adam Smith Institute can all go to hell. But therein lies the problem. One person’s intellectualism is another person’s spindoctorism! (Pigliucci’s prosaic term, not mine). In dealing with the interplay between science and politics, the classic example simply has to be global warming. Most reading this will not need me to go into this topic, there simply is no scientific debate on the realities of global warming – merely some minor debate over rates of change and extrapolating the complexities of the causal factors. Dissenters use pseudoscience and blatant corruption to give the illusion of a debate as this suits the interests of corporate paymasters. Some absurd bunk serves nobody’s interests, yet can be so passionately subscribed to that it raises questions of where we should draw the line between what is acceptable and unacceptable to society as a whole. The example that Pigliucci focuses on is the battleground between evolution theory and intelligent design theory that ended up in American courtrooms to ascertain their relative merits on the science curriculum of american schools! I have dealt with issues of christian fundamentalist schooling elsewhere. Current Conservative education policy opens up the prospect of us having to fight similar battles here, although currently creationism is not allowed to be taught as part of the science curriculum (in theory at least). This resurgence in ‘Dark Ages’ mentality links in with the section of Pigliucci’s book that looks the history of scientific thought from the Egyptians and Babylonians. For me, it was the Socratics of Greece, and Lucretius in particular, that demonstrated just how lost humanity, in Europe at least, became after the fall of the Roman Empire with all its great applied science/technological achievements. While acknowledging that medieval times were not entirely without their achievements – ironically enough especially in Islamic countries – the role of the christian church in undermining rational thought and consigning much science to the status of heresy cannot be ignored. Indeed, another prompt to this article is witnessing another friend of mine ‘finding’ religion and openly professing biblical fundamentalism of the creationist and ‘flat earth’ variety. It is bewildering and sad to witness in an otherwise intelligent, creative and articulate person. That may come across as patronising, but only to those that think such views are acceptable. I find that attitude far more patronising. As an educationalist, the peddling of nonsense can never be acceptable and we owe it to all involved to be steadfast in challenging it. There are, of course, legitimate questions as to whether we have grown to trust science too much. Pigliucci examines this in detail. I think the bottom line here is that good scientists never trust that they have the final definitive answer. In many cases there can often be more than one correct answer, for a start. Furthermore having scientifically correct answers is not the same as having the best solution to a problem. This is one reason for ongoing friction between scientists and philosophers on some issues. The problem is among people that do not fully appreciate the scope and limitations of science. Nonetheless, science remains by far the most effective way of gaining knowledge (and power, as Francis Bacon famously pointed out) over the natural world and improving the human condition. This is why we simply have to rein in the extreme versions of science criticism that have developed over the last few decades. Thus the question that we now need to pose is whether we have come to trust science too little. Pigliucci tackles this issue by focussing on the impact of postmodernist scepticism. He focuses in particular on people like Paul Feyerabend, who he cites as “the quintessential example of what goes wrong when science and the humanities collide”. In essence he demonstrates how Feyerabend deliberately created controversy by stating outrageous things that he didn’t really believe for the express purpose of selling some books. Controversy, per se, is an important element in any form of intellectual discourse, and I agree with Pigliuccis that we ought to respect people who have the guts to to say what they think regardless of how popular their positions may be, irrespective of whether they turn out to right or wrong, but spouting things that are are demonstrably untrue for personal gain is an intellectual travesty and pernicious fraud. For me, it saddens me to see people being taken in by these charlatans. In the left wing circles that I tend to spend a lot of time, I see a lot of people rightfully mistrustful of “Big Pharma” and the distortion of science by corporate interests. However, this seems to have a created a propensity to be taken in, all too easily, by the quackery of what I now call “Little Pharma” peddling all manner of supposedly naturalistic approaches and remedies. It appeals to Earth loving souls, pagans and avowed hippies in particular. Kindly, gentle souls with their hearts very much in the right places; it can be a painful experience trying to point out how it is they are being conned and fleeced in much the same way as big pharma cons and fleeces governments and health professionals, but with even less hope of successful outcomes. If it is not clear to anyone reading this that this is a million miles away from proving anything “without doubt”, or that indeed these findings are absolutely riddled with doubt, then you may as well stop reading now. After a bit of ding-donging from mothers wrestling with what they perceive to be a difficult decision, we come across a very telling contribution that says: “I just thought I’d share I never vaccinated [daughter] when she was little. Before we went to India last year I had a couple of precautionary vaccinations given to Her. She was almost 9 at the time. She was then and remains one of the healthiest children I have ever met.” I guess there is nothing like hedging your bets! I could not resist: “I am curious as to why you thought it was a wise precaution to have vaccinations before going to India, but not while in this country. Is it, perhaps because virtually everybody in this country has been vaccinated and largely elimianated the threats whereas the lack of a comprehensive vaccination programme in India means that the threats are much greater?“ No response from this mum as yet! Having been accused of being patronising and intolerant, I simply posted a quick barrage of articles highlighting the resurgence of many diseases in response to the undermining of vaccination programmes by people opting out. This was met by the another resort to supposed authority in the form of Kelly Brogan, MD. She describes herself as ‘a holistic women’s health psychiatrist’. Mind games very much to the fore and, of course, she has books for sale with all the answers and you can even have your own personal consultation in her Madison Avenue office suite – for a price of course! ($1000 for the initial hour, then $450 per 40 minute follow up appointment). Nice work if you can get it. And it appears that a bit of brazen tenacity and a lack of a conscience is all that is needed. She is neatly dissected here, and the discussion thread at the end makes interesting reading too. Even when more credible experts are brought in by the anti-vaxxers, there are problems. The Facebook thread follows up Brogan with a reference to an acknowledged expert in HPV vaccines, namely Dr Diane Harper, under the headline “Chief HPV Scientist Admits Vaccines Are A Deadly Scam”. Which scientific journal was breaking this news? It was YourNewsWire.com, who make a speciality out of running with conspiracy stories. However, a little digging reveals the extent of the mis-reporting going on here. The concerns raised were not over vaccines in general, but Gardisil in particular. And the concerns were not that Gardasil is ineffective, not that it’s dangerous, but that its benefits might be oversold, which is not an unreasonable concern in this capitalist world of ours. Indeed Harper is quoted as saying: “I remain a vaccine supporter; and am grateful that GSK and Merck have developed the vaccines”. Ideally a proven track record in their field – which may be hard on young prodigies, but their time will come. On this basis, Pigliucci demolishes Deepak Chopra, supposed expert in ‘quantum mysticism’, and Michael Behe, supposed expert on ‘intelligent design’. George Monbiot nominates Christopher Booker as the ‘patron saint of charlatans’ for his efforts in undermining asbestos science and climate change denialism. I expect we can all offer up our ‘favourites’. Con artists can often be viewed as loveable rogues for their audacity and charm – but they all leave trails of victims in their wake, and many of the issues I have alluded to here have the potential for deadly consequences on a large scale. Flat earthers can be pitied and/or ridiculed for there are few if any consequences to their stupidity. What is the worst that can happen, even if they are proved right? A crash in demand for round the world flights and cruises is about as far as I can imagine. Climate change denialists have probably already condemned us to a future full of catastrophic consequences. It remains just a question of how soon and how severe the worst of consequences hits us. Related conspiracy theories, like chemtrails, leave me with some unanswered questions, but I remain very sceptical that there is anything going on a global scale as some would have us believe. GMO crops is an interesting one. I remain in the anti-camp despite firmly believing the technology offers great scope to advancement, but I simply don’t trust the people an corporations involved to do the science rigorously enough to mitigate the potential risks. At the end of the day, we all have to make our own judgements on what we believe to be true on all manner of issues. A belief in the rigorous application of the scientific method as the best way we have of getting as close as possible to the truth. The challenge before us is how to ensure that this is properly understood by in a world full of mischief, deceit and ignorance. P.S. The anti-vaxxers have a new focal point for their campaign in the form of a film called Vaxxed, which opened in New York three weeks ago, featuring the work of the discredited Dr Andrew Wakefield – barred by by the GMC and now to be found making a very comfortable living in America. In both cases read the discussion threads that follow the main content. This entry was posted in Uncategorized on April 25, 2016 by Bridgend's Green Leftie.